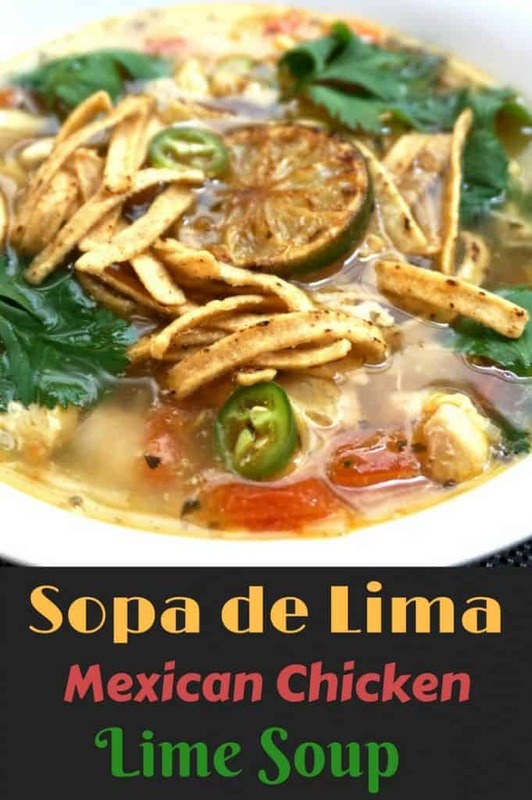 Sopa de Lima is a traditional soup from Mexico’s Yucatan region. It is similar to the better known Tortilla Soup but adds a fresh citrus flavor with the liberal use of fresh lime. The limes used in the Yucatan Peninsula are often a variety called “lima agria,” which are slightly sweet and bitter at the same time. I think of the flavor as a combination of tangerine, lime and grapefruit. They add a very fresh light flavor to the soup but are often difficult to source outside of Mexico. In my version I’ve used fresh limes, but feel free to substitute a little grapefruit juice instead. Key limes are also a good choice if you can find them. If unable to locate fried tortilla strips you can make them the traditional way by cutting a few corn tortillas into strips and frying them in hot oil until crisp. Place the chicken cubes in a frying pan with vegetable oil over medium heat. Brown on all sides and then set aside. Mince 1/2 of the jalapeno pepper and thinly slice the rest into thin rounds. Add the onion to the frying pan and cook, stirring occasionally, for about 5 minutes. Add the garlic, tomato, minced jalapeno, oregano and cinnamon. Saute until the onion and garlic are are browned and translucent. Place the onion mixture and chicken in a stock pot. Return the frying pan to the heat. Place a few fresh lime slices in the pan and brown lightly on both sides. Set aside. Squeeze fresh limes into the frying pan (yield should be about 1/4 cup of fresh lime juice). Remove from the heat. Add the chicken stock to the stock pot and increase the heat until the soup begins to boil. Add fresh lime juice and 1/2 of the cilantro and a dash of hot sauce to the soup. Reduce the heat and continue to cook for 5 - 10 minutes. Add salt and pepper to taste. 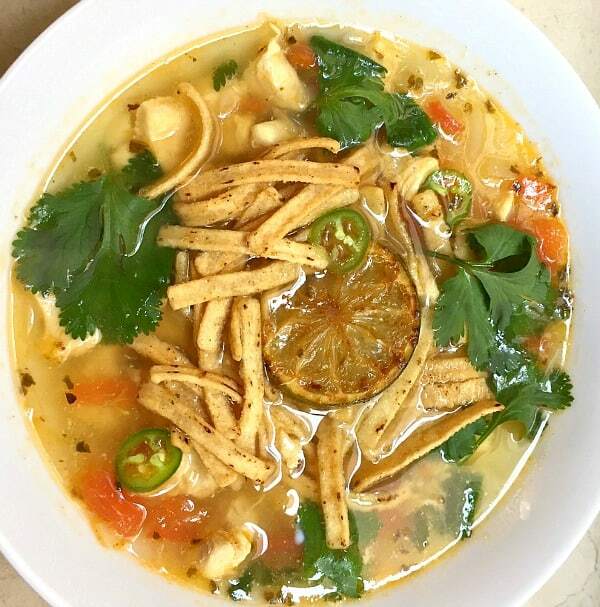 Ladle the soup into bowls and garnish liberally tortilla strips.and garnish with fried lime slices, jalapeno slices and fresh cilantro. Visit our food finds/recipes section to view our collection of international recipes inspired by our ongoing travels around the world. I’m under the weather right now and need to make this soup for dinner! 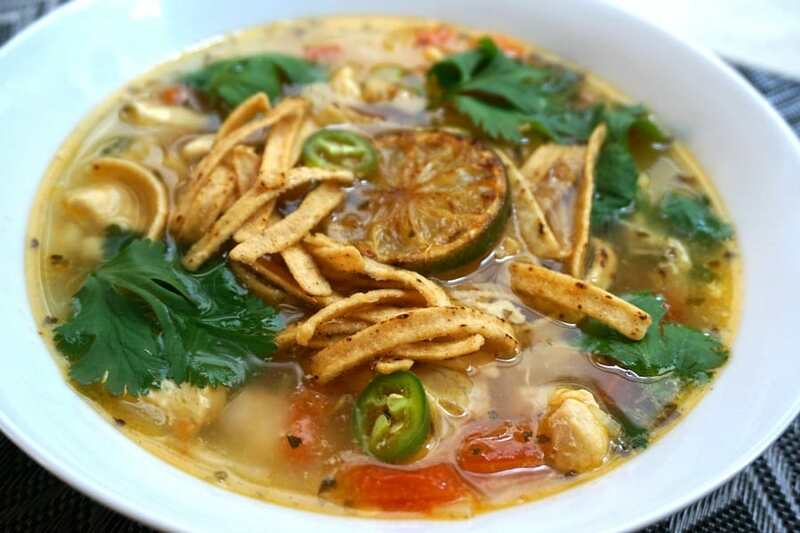 Chicken tortilla soup is one of my favorites and yours looks really delicious. I hope you enjoyed it! I made it for my husband when he had a head cold and it was just the perfect thing!